When I first got these velvet jeans in the mail, I had no idea what I was going to wear them with. But from the second I slipped them on I knew I had to keep ’em. They are super soft and comfortable, fit so well with a very skinny leg and high-rise waist, and are surprisingly very flattering! They come in a bunch of colors (black, deep green, royal blue, eggplant, red… just to name a few! ), but I thought the cognac color looked the most unique and “fall” to me… and being in Texas I’ll certainly be able to use them for football games and such! I had originally planned to find a cute fall plaid or houndstooth blazer (featuring the same rust color!) 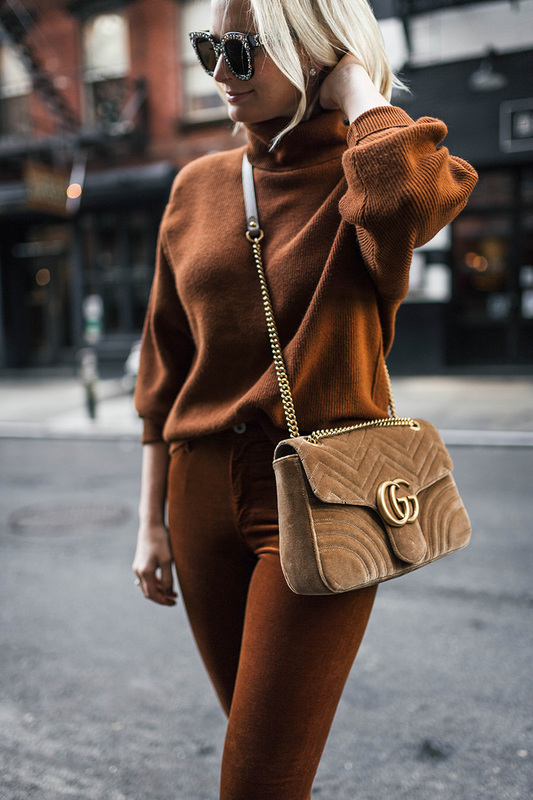 to wear with these cognac velvet jeans, but before I even had a chance to look I noticed it matched perfectly with this cozy turtleneck I already owned. I don’t do monochromatic outfits very often (unless it’s all black or all white! ), so I thought this would be an exciting way to mix up my look for the season. 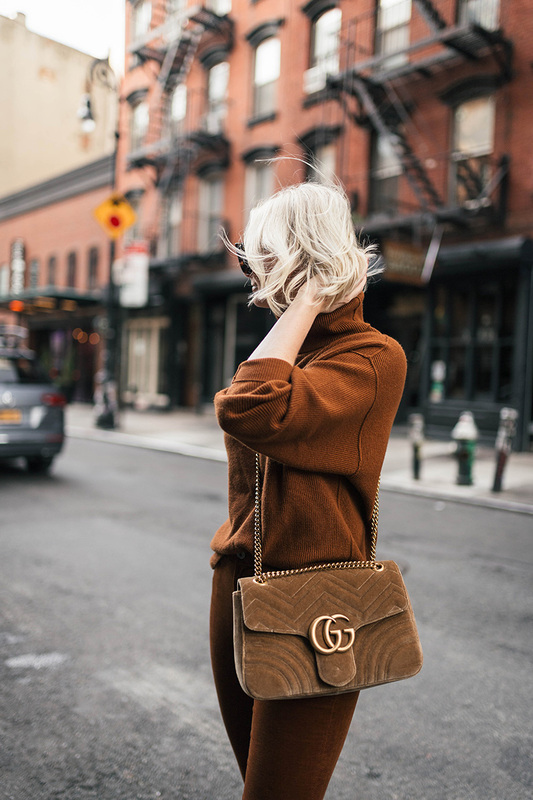 Paired with complimentary camel and beige hues like my Gucci bag and favorite neutral boots (my color is from last year! ), the look is very fashion forward and super fun. I love how rich and luxe all the colors look when worn together, don’t you? 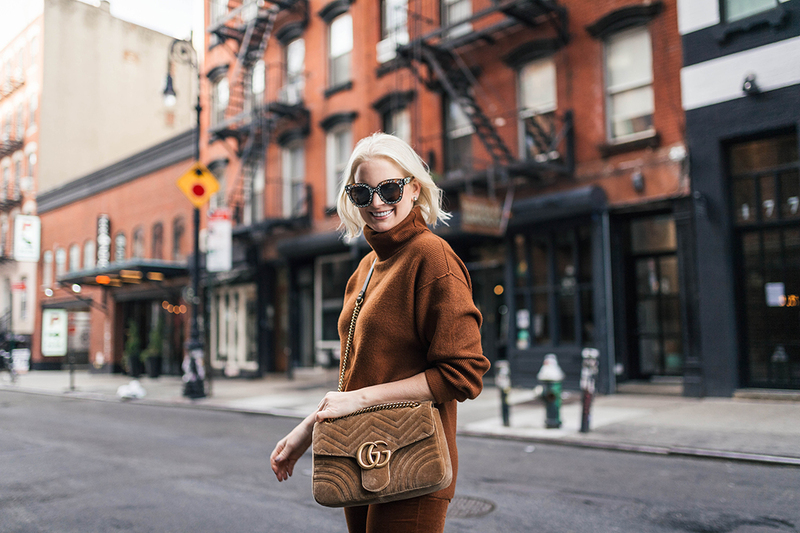 Whether you want to recreate this whole look or not, I highly recommend picking up a pair of these fabulous velvet jeans in whatever color you love. You will not regret it! I found more sizes in these jeans available here if you need more options. I’ll share more ways to style this color soon, so stay tuned! These jeans are amazing love the color and velvet finish. By far my favorite outfit of yours! So so cute! Fabulous look! In love with those boots!!!! I love the monochrome with the mix of textures. So rich and luxurious!